It can be delivered on a specialised appliance or on the customer's hardware, but the GUI is quite basic. Velocimetrics can be deployed as a software or hardware based solution. It captures business-level data from multiple sources, then associates, correlates and aggregates this information together in real-time. The product can be clustered for resilience and scaled to cope with complex and high volume environments. Velocimetrics licensed the intellectual property rights to TS Associates’ Tipoff and Application Tap products in 2014, and most of the former employees of TSA now work for Velocimetrics. At present, TipOff, Application Tap and Velocimetrics are being maintained as discrete product lines, but there are interesting signs of convergence. Data from the monitored environment can be acquired using a variety of methods, based on individual client requirements. The techniques employed include network data capture methods, collecting data from inside an application or as the data traverses middleware queues. The product can gather information from network packet capture or passive subscription to middleware queues. There is a library of converters and adapters that can decode commonly used middleware and exchange protocols including FIX, FAST, LBM, RV, RMDS, Xetra, ITCH and OUCH. A decoder SDK is available to handle proprietary protocols. Java, C#, .NET and C++ processes can be instrumented using an embedded probe or external probe and can be used to apply accurate timestamps to transactions to measure performance both within and between servers. Process logs can be monitored either directly using a logging API or indirectly via a file processing client. 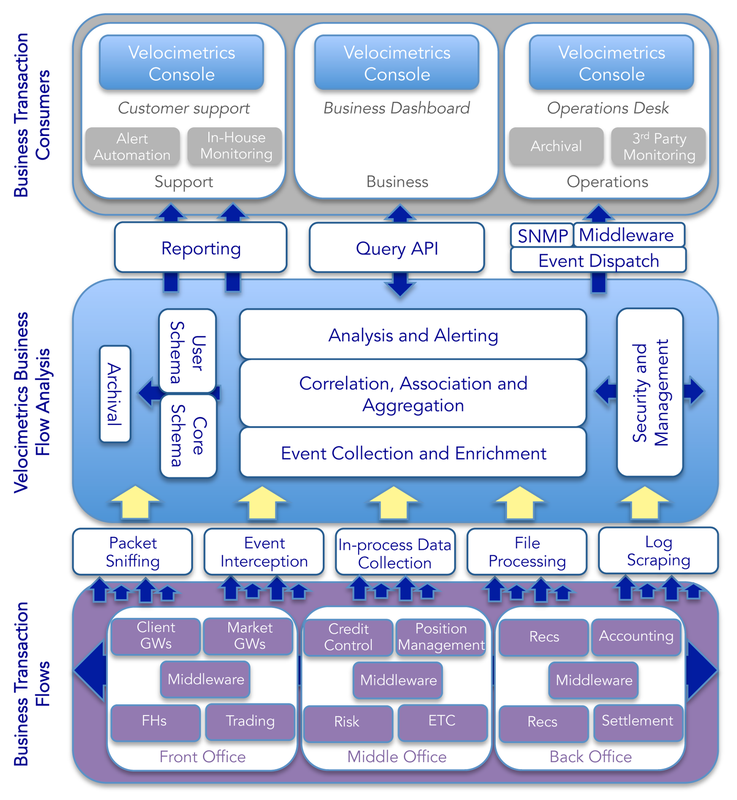 The software can allocate a unique identifier to each transaction which enables the path of all payments, orders or trades to be reconstructed as an end-to-end flow, helping to identify out of sequence data or lost messages.The product has the ability to model multiple cause and effect relationships and complex correlation scenarios in real time, identifying for instance which market data ticks generated an algorithmic trading decision that resulted in a trade at a particular price.The same principle can be applied to data captured on the wire, extracting and correlating the contents of various fields to give useful metrics such as traded value with a particular counterparty or a specific instrument. In a payments environment there is a capability to handle a single transaction that splits into multiple transactions – the fan out/ fan in model.This also enables trades to be traced when orders have been executed as a complex series of child trades, identifying the required relationships. The Velocimetrics Expression Language (VEx) allows values to be compared with historical norms at the same time of day. These can be calculated over a period of up to 30 days allowing a flexible mechanism for handling patterns of data that are predictably variable during the course of a day. VEx can be used to concatenate multiple attributes and correlate them to detect, for example, deviation from expected behaviour that could result in an SLA breach and raise an appropriate alert. The GUI is a container based thick client using Eclipse. Containers can be broadly grouped as chart views with a gallery of chart types, table views; and a connectivity inferencing view. This latter is an effective means of visualising flow, latency and volumes, where the characteristics of the pipes representing connections between end points such as colour or line thickness can be linked to different aspects of the flow. A basic RAG coded traffic light widget can be used to alert if a single or aggregated value is in a warning or failure state. All views have drill down capability that can be used to assist with the identification of issue origin. Users can also generate configurable reports in PDF or CSV format on demand or on a schedule that can be automatically emailed to a pre-loaded list of recipients. Download our free Application Performance Management (APM) Report and find out what your peers are saying about Velocimetrics, Mackerel, IDERA, and more!